Does Water Ever "Go Bad"? The water on your bedside table hasn’t had anything bad happen to it while you slept, but in the morning it tastes stale. Why? And how long can water stay out before it’s too bad to drink? We know that water, after a few hours of sitting out, tastes indefinably nasty, but it’s tough to say how. Many people would guess that the taste change is due to the little things that go swimming around inside the water. They generally are there because, even if your water is clean and your dishes are clean, your mouth is dirty. Any sip you take from the glass will transfer microorganisms into your water. They’ll often be joined by whatever is riding around on the dust swirling in your house. At first these microorganisms get killed off by the chlorine additives leftover in most kinds of tap water. After a few hours they start multiplying, and at room temperature they multiply fast. (On the other hand, clean water in a clean open bottle in the fridge can keep for months, and clean water in a sealed bottle can keep pretty much indefinitely.) 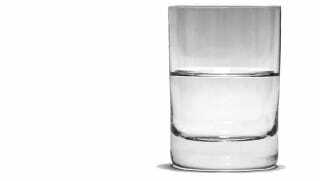 This is rarely a danger to a healthy person, but a “stale” glass of water is still much more populated than you may realize. That’s not what you taste, though. If you were that taste-sensitive to microorganisms, every bite and sip you took would probably taste primarily of bacteria. The molecule that changes the taste of your water is the molecule that changes the taste of your soda: carbon dioxide. Carbon dioxide dissolves in water and forms carbonic acid. As soda goes flat, some of the carbon dioxide escapes into the atmosphere, but some also dissolves in the liquid. Plain water exposed to the atmosphere doesn’t have as much carbon dioxide in it as soda does, but it does get some unpleasant acidity. Essentially, after water has been out too long, you’re drinking very mild acid rain.